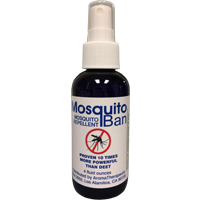 Mosquito-Ban is formulated to keep annoying, disease carrying mosquitos off your skin. Guaranteed! The spray is based on natural Catnip oil which has been proven by research at Iowa State University to be 10 times more effective at repelling mosquitos than the commercial chemical that is used in most mosquito repellents. This stuff really works and works better than anything else your can buy. If you've previously tried Catnip oil and not liked the smell, you will be pleased to know that Mosquito-Ban is made with several other pure essential oils to give it a fresh, pleasing aroma. Order today and stay bite-free this summer. Comes in shatterproof bottle with spray top. Product Contains:proprietary blend of essential oils including citronella in a base of golden jojoba.